Timesheets are used to track the time that your team members work. While shifts are used to schedule and estimate team member hours, timesheets are used to track when team members actually worked. This help guide will walk you through everything you need to know to use timesheets effectively. Most businesses that use timesheets in ZoomShift also use the web or mobile time clock. This allows team members to clock in/out to create timesheets. Learn about how to use the web time clock and how to use the mobile time clock. 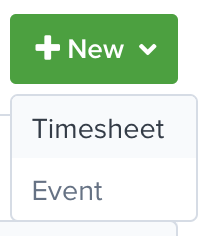 To create a new timesheet, go to the Timesheets => Team Timesheets page and click on any cell or click on the New button and click the Timesheet option. Approved Approved timesheets are used in the payroll report. Note The note field provides more information about the timesheet and is visible for the team member and supervisor. 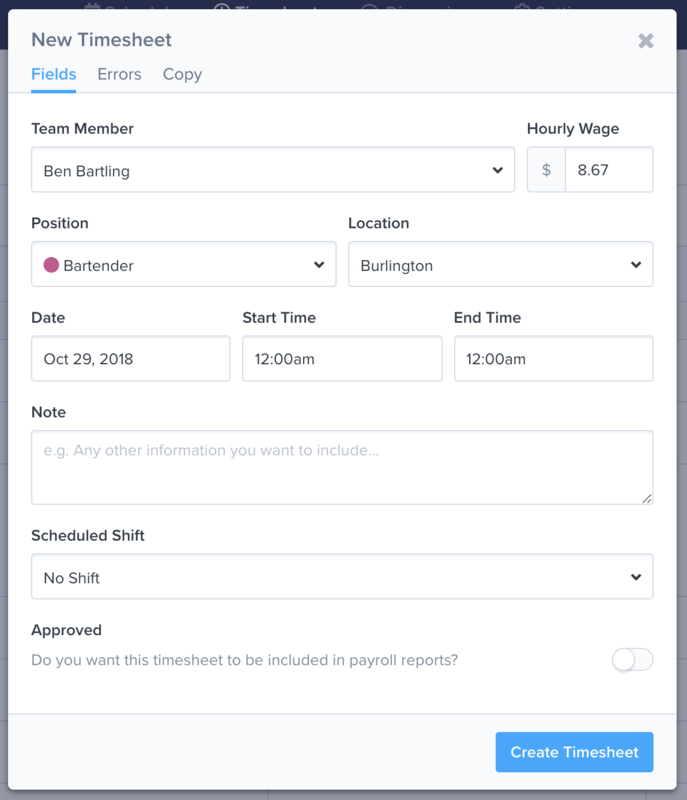 Hourly Wage The hourly wage field is automatically populated by the value set in the team member's profile. However, you can override this value if you want. You will notice that changing this value will change the wage total for the timesheet. The Errors tab shows any errors that may be caused by your timesheet error rules. Learn about timesheet error rules, here. Note: Your timesheet error rule settings may block the timesheet from being created. You can update your timesheet rule settings or ignore the timesheet error rules from this tab. Most organizations rely on the web and mobile time clocks to collect team member timesheets. However, you can also allow your team members to manually edit their timesheets. To enable this setting, go to the Settings => Timesheet Settings => Timesheets page and enable the following. Any changes that your team members make will automatically be unapproved. A manager will still need to approve the timesheet before it shows up in the payroll report. Sometimes you will want to know who edited a timesheet or when a timesheet was approved. You can view a full audit log for each timesheet clicking the History button at the bottom of the pop-up window.